Behavioural Study of Obedience Stanley Milgram 1963 Many atrocities had been committed in the Second World War. Many culprits were put on trial for their lives in Nuremberg, at the end of the war. The chief defence was that they were only following orders from somebody above. This argument, followed to it's extreme would absolve every person involved in an atrocity, leaving only Hitler as the only person who could be found guilty (as he took orders from no one)! Naturally, with feelings running high at the end of the war, this defence was rejected outright, and many defendants were found guilty and hanged. Popular opinion for some time after the end of the Second World War was that there was something in the German character that made them particularly cruel. This is a dispositional view. People are genetically determined to act in a certain fashion, or are brought up to act in a certain fashion. Milgram questioned this dispositional view of the German character. He felt that the situation that many people had found themselves in had led to their cruel behaviour. It would follow from this, that most people, regardless of nationality, would perform cruel acts upon another, under certain situations. The defence for many of the war criminals had been they had been following orders. Milgram, reasoned that people could commit atrocities when they are given orders by somebody in authority. 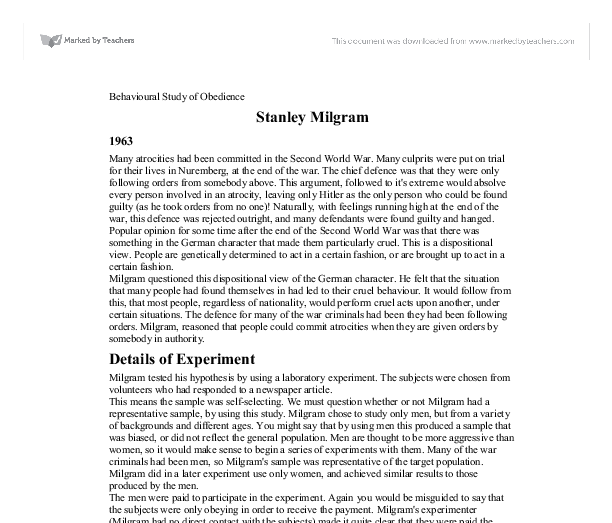 Details of Experiment Milgram tested his hypothesis by using a laboratory experiment. The subjects were chosen from volunteers who had responded to a newspaper article. This means the sample was self-selecting. ...read more. This allows the subject to get used to following the instructions, and gives them a chance to warm up and produce a reasonable performance. The experimenter can also make sure that the subject is following his instructions carefully, and the experimenter is given a chance to correct any problems. The victim gives responses after each question, until the 300 volt shock. At this point pounding on the wall is heard and no response to the question is received from the victim. As you might have expected subjects turned to the experimenter for guidance at this point. The experimenter instructs the teacher to treat the absence of a response as an incorrect answer. The victim pounds on the wall (you will gather by now his legs are not bound!) at 315 volts, and continues not to answer the questions. At higher voltages the victim gives no response whatsoever, giving the impression that he is at the very least unconscious, and at the worse dead! Naturally, subjects will turn to the experimenter for guidance, before administering shocks of greater than 300 volts. The experimenter gives one of four scripted prods. 1. Please continue 2. The experiment requires that you continue 3. It is absolutely essential that you continue 4. You have no other choice; you must go on. The experimenter would initially use prod one, but if the subject refused to continue, the experimenter would try prod 2, and then prod 3 and finally prod 4, breaking off as soon as the subject continued. (How does this accord with the ethical point of allowing the subject to withdraw?) ...read more. Milgram's experiment was deliberately ethnocentric, as he was interested to see whether Americans would be as obedient as German subjects. The results obtained from the American sample meant it wasn't necessary to test the German sample, as the Americans were expected to refuse the orders of the experimenter. Other psychologists have tested subjects from many different cultures and found that generally people regardless of culture tend to obey people in authority. Ethical considerations in Milgram are: � Consent - not informed. Participants volunteered for a learning experiment not one on obedience. � Deception - As to nature of experiment. Shocks not real. Victim not really a participant. � Asking colleagues - At first colleagues were asked and they said that the experiment would not cause any psychological problems. However, Milgram could have stopped at this point, but he went on to conduct numerous other trials. � Protection of participants - the participants displayed symptoms similar to that of a nervous breakdown. � Withdrawal from the investigation - physically yes the participants could, but with strong social pressure on them this was unlikely. The prods used, such as 'you have no alternative, you must go on' achieved this. � Observation - participants were filmed without their consent. � However, Milgram did debrief the participants. I trust Milgram was confidential and the participant's names that he used were made up. Your questions 1) Evaluate the problems of generalising in psychology, using Milgrams` > study of obedience as an example. > Just think of the artificiality of Milgram's study and you begin to see the problem of generalising. Additionally think of the self-selecting sample as one that is more likely to do as they are told. Return to Gary Sturt's Homepage _ ...read more. This student written piece of work is one of many that can be found in our AS and A Level The Psychology of Individual Differences section. The writer has gone into a great deal of detail about the experiment that Milgram carried out. There is very little to change in this essay since most of the comments made are positive ones. 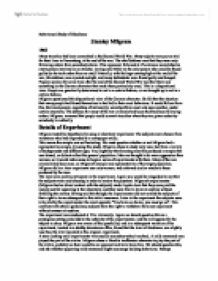 This work covers just about everything involved with Milgram's study and is an accurate account of the way in which the experiment was carried out. The writer has also given a thorough critique of Milgram's experiment. It is a really good piece of writing and worthy of full marks. Humanists propose that humans do have free will and are not the sole product of their environment or childhood experiences. Humanists argue that people and personality should be viewed as a whole and that the breaking down of various aspects of personality results in the loss of the whole. Such understanding has been applied in a hospital setting to reduce stress and anxiety to help patients recover quickly. The cognitive approach is also useful and has made important contributions to the field of psychology, particularly that for the treatment of depression. There is no scientific proof to support Freud's theory. Freud was one of the first psychologists to demonstrate a link between our minds and physical illness; he was also the first to highlight the importance of our childhood and its development. One of the first behaviourists was Edward Thorndike (1874-1949), an American psychologist who studied the behaviour of animals. He noticed that some events, usually those that one would expect to be pleasant, seemed to ?stamp-in? a response that had just occurred. Two key figures within the humanistic approach are Abraham Maslow and Carl Rogers. Maslow is best known for his hierarchy of needs and this describes the needs which have to be met in order of priority for a person to become fully complete as a person. This model is criticised for the use of drug therapy in treatment options. Drug therapy is said to be too heavily relied upon and is too quickly assumed to be the cure for the problem. This does not take into account that chemical imbalances may be a symptom of the illness, not a cause. Looking at all theories I believe that it is impossible to predict where you get your personality from because there are so many life changing experiences that you live through and situations to affect how you act. Sport is definitely a good example of how personalities can change so easily. Level 2 Counselling skills. Theories -CBT, Psychodynamic and Person Centred. In each of these stages, frustration or overindulgence may lead to a fixation on that stage and predictable adult personality characteristics. Freud?s theory therefore considers the influence of nature (things we are born with) and nurture (things that develop through experience). What are the effects and reasons for human â€˜Eating Behaviourâ€™?